Aadhaar is slowly made compulsory for everywhere. As it is a solid proof of an individual and no fraud can be done using Aadhaar, it is turned a huge evolution these days. Government of India has already said that without linking aadhaar with bank, the bank account will no longer valid. Of course, the work is yet completed and thus upto 31st March 2018, the validity is there. Linking the aadhaar number with PAN card, debit card, credit card, etc is made mandatory now. 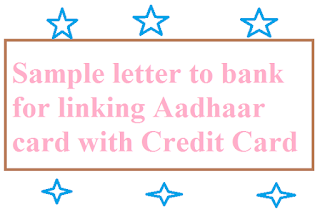 So if you want to link your adhar number with your credit card, you must approach your bank where you maintain your account and request bank manager to link your credit card with your aadhaar card (12 digit number). If your bank manager asked you to write a request letter to link, then you must submit a written statement as a request. Here is a sample letter format for the same. As you know I am one of your customer in your concerned bank here. I have obtained a credit card, No. ______________ (Write your 16 digit number here) few years back. 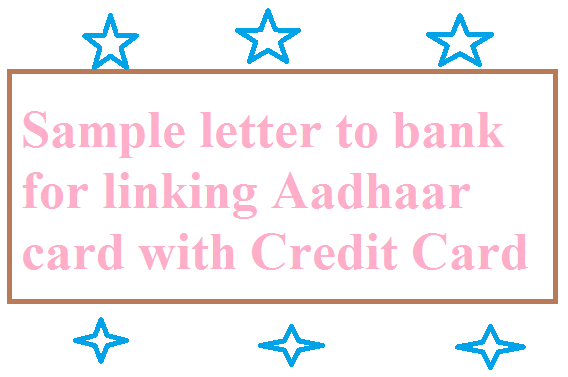 I want to link my aadhar card with my credit card. Please accept this as request and do the needful as soon as possible. My aadhaar card number is xxxx xxxx xxxx (Replace xxxx with your aadhaar card number) . I have also attached the copy of my aadhaar card and credit card / passbook. Thanking you! Note to visitors: Please use this sample letter as a template for your writing your letter. Replace the particulars where ever you need. Thank you!